Second-highest peak in the Darrans. Climb the rock steps from Turner’s Pass. Margaret Clark, Jim Clark, GD Cowie, Dec 1958. From the Madeline Snowfield climb the snow face to the South West Ridge. The North West Ridge was used in the first traverse of Madeline. The party descended the top of the East Ridge then traversed snow ledges to Turner’s Pass. Bill Blee, Ron Dickie, Bill Gordon, Ralph Millar, Jan 1955. Alf Cowling, Samuel Turner, 1920. From the old moraine ledge above the lower glacier follow a ledge up to the broad snow-ridge and climb this to a rock step near the summit. R Offer, G Mason, A Witten-Hannah, Dec 1953. Start from the Hollyford Valley and head up Madeline Creek, to gain the ridge just beyond the bushline. A long climb. 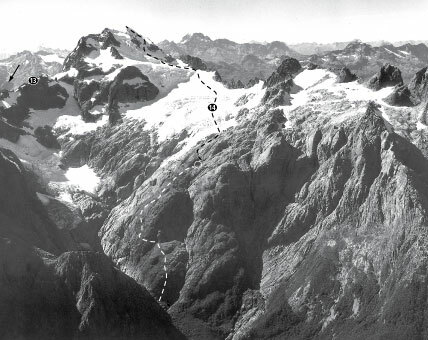 The first ascent traversed the mountain to Turner’s Bivvy and the Tutoko Valley. Climb to the Madeline snowfield then up the snow face to the South West Ridge. Jim Strang, Bruce Clark, Paul Corwin, Aug 1976. A good route with a fun rock climb leading directly to the satellite summit of Mt Madeline. Access the rock ridge via the Madeline Snowfield or via the col east of PT 2119.